A range that is made especially for Asian skin! 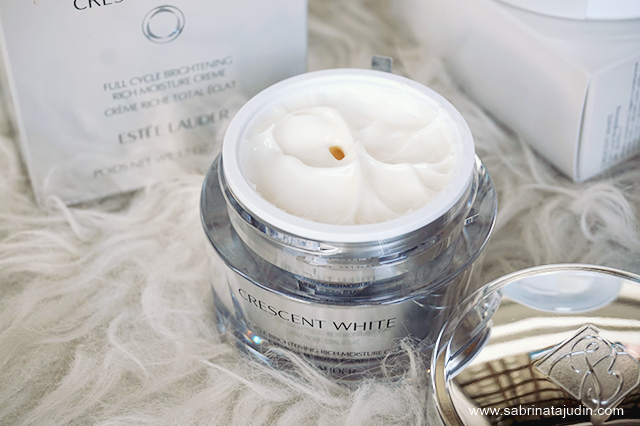 The new line from Estee Lauder called Crescent White Full Cycle Brightening has a full range of skincare products you can check out. From essence, cream, BB Cream, mask and more. I'll be featuring some of the products I got and let you know what it is all about. 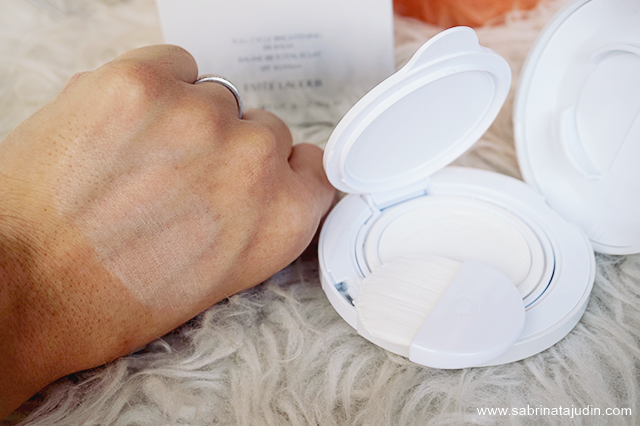 I am a sucker for whitening skincare. Well, like most asian, we like to be fair hehe. I love skincare that has whitening benefit and care. This new line from Estee Lauder are great for you of you want a fairer, brighter and more translucent skin with its new breakthrough approach or technology of skin brightening. It is said to work with skin's circadian rhythm. 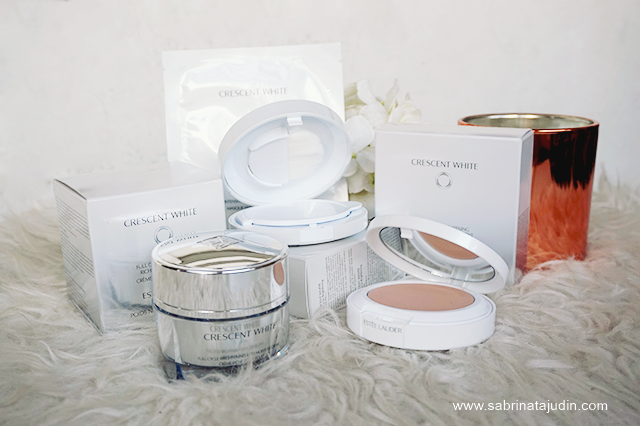 This creamy cream is a luxury treat to your skin. It helps to deeply care your skin with hydration and comfort. 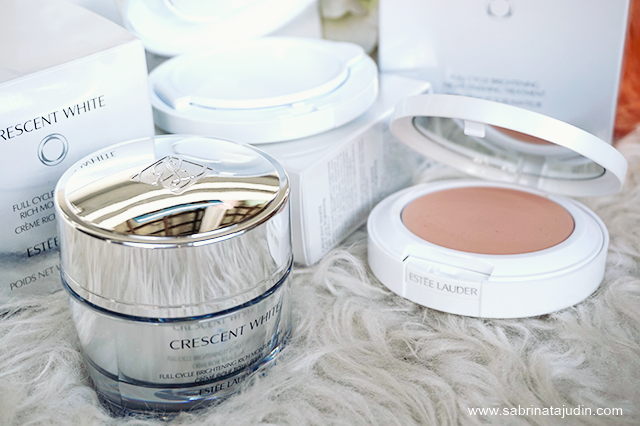 Come in Estee Lauder signature jar only that in this range its white. It is a ultra-rich creme formulated to help prevent the look of dark spots, discolorations and uneven skintone. After days of using this, you can notice a brightening effect or your skin will look fairer.The benefits of this cream is that it helps hydrates and help to reduce your spots. This cream is ideal when you are feeling like your skin is dry and you have spots & uneven skintone. Suitable for all skin types. This retails for RM312.00 each and more info go to here. A unique product that got me confused when I got it. It comes in this like compact case like a normal face powder comes with. As I open it I saw a small brush with a white synthetic hair. It was attach on the top part of the compact. On the second layer is a cream. It said that use this as a night treatment. Sweep this using the brush every on your night skincare routine. Apply this over your face, neck this will leave your skin soothe and with an immediate porcelain finish. The brush it comes with was told to give you a spa like experience when using this cream. 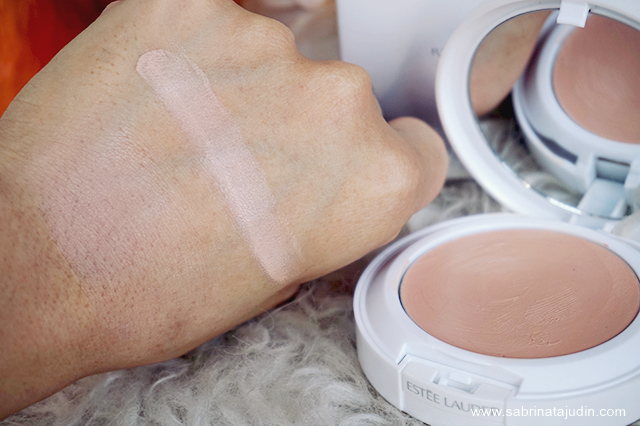 The cream looks white, but as I blend it, it melts into like a cream texture. This retails for RM238.00 each and more info go to here. 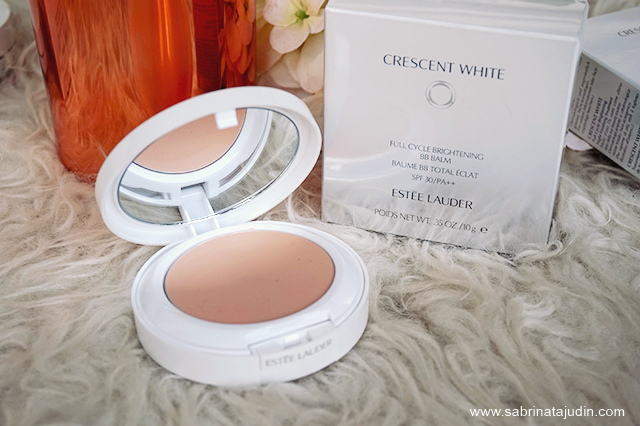 A BB Cream Compact that is great for everyday use after using these skincare like. If you are a person who does not wear foundation and want something to help give you an even skin-tone at the same time helps protects and repair your skin. Go for this kind of product. 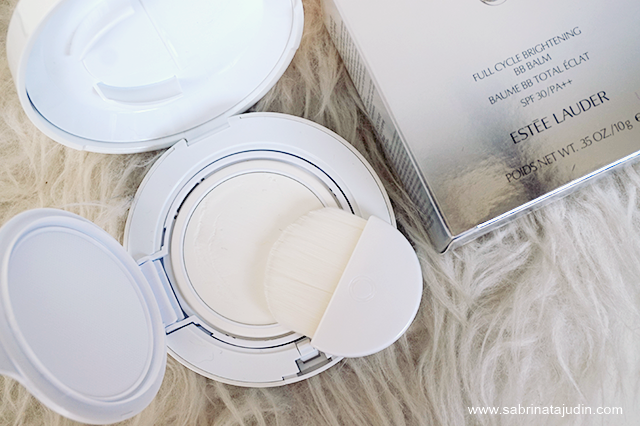 It is an innovative BB Balm compact that is lightweight and gives you that natural looking skin. Comes in only one shade, might be suitable for people who have fair to medium skin-tone. It helps to prevent your skin looking dull, prevent new dark spots and has powerful antioxidants and SPF protection. I used this a few times and I glad I love it! This is my staple product when I am on the go. 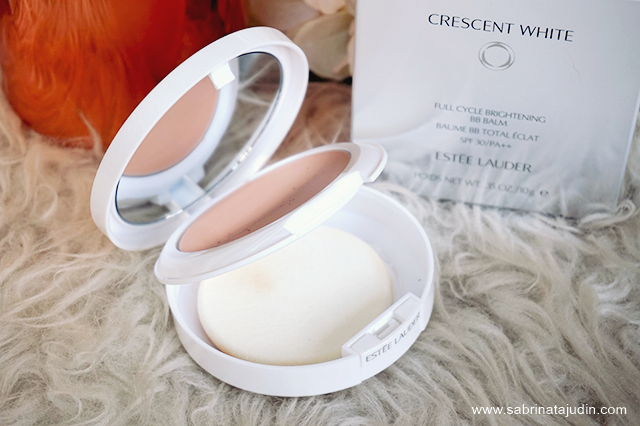 It works like a face powder but with its creamy texture, it helps to covers my redness pretty well. It is not oily and I love the natural looking finish it gave to my skin. This retails for RM196.00 each and more info go to here. A mask that is infused with spot-correction active ingredient. Use it for 10 minutes and skin will look moist, soothed, plumped and bright. Comes in a box with 6 individual-wrapped mask. Recommend to be use 2 times a week during night time.This retails for RM300 for 1 box which consist of 6 sheet mask and more info go to here. You can purchase Estee Lauder product at any Estee Lauder beauty counters, Sephora or even online (direct link listed above). 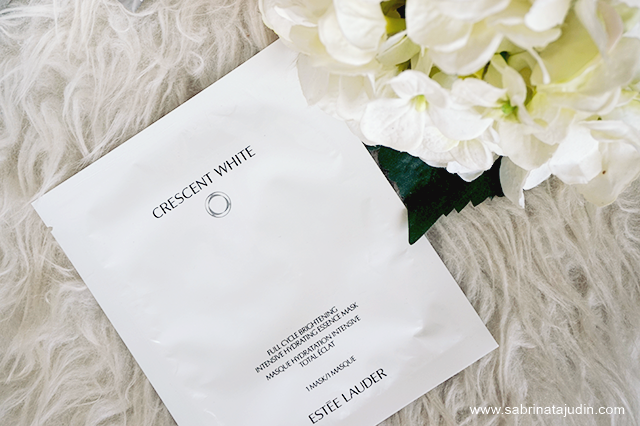 Check out the full range of Estee Lauder Crescent White here - (link) . Hi I just found your blog through Pinterest! I came across your NYX matt lip creams post and went through your blog after that! I've followed you and can't wait to read your future posts! The hydrating mask sounds really good too!